Not content to completely embarrass our simian ancestors just by building rocket ships, mobile telephones, and the bulldozers necessary to pave over their homes, humanity now asserts our complete and total mastery of Earth by creating photo-realistic recreations of the silly little monkeys we evolved from. Witness our power and tremble as War For The Planet Of The Apes director Matt Reeves explains the process of turning real, bipedal actors into believable apes in this video for Vanity Fair. The long and the short of it? Making the movie’s cast look so good seems like a whole lot of work. (A lot more work than stealing tourist peanuts or learning sign language for “love,” monkeys.) 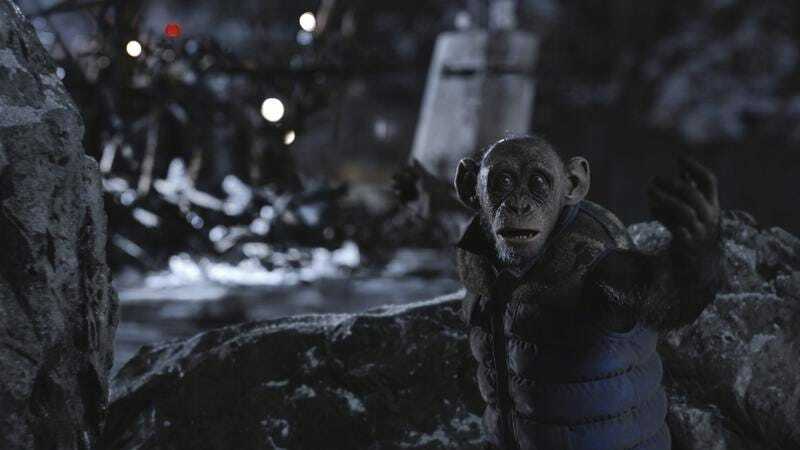 Actors wore motion-capture suits with cameras pointing at their faces to capture the body language and facial expressions of angry apes, sad apes, and, of course, apes holding shotguns. The animators at visual effects studio Weta Digital then made the transformation, trying to preserve the original performance while turning people like actor Karin Konoval into enormous, frilly-faced characters like Apes’ orangutan Maurice. Reeves’ summary of the process sheds some light on the talent that goes into creating the computer-generated creatures, robots, and uncanny valley ghosts that fill modern cinema. “The idea of the movie is to create emotional empathy and identification with apes so that, by the end of the movie, everybody watching the movie is an ape,” he says. He might be overselling the impact of a film series stuck between allegory and sheer spectacle, but we can also choose to believe that he means something different, perhaps hinting at a future where humanity is wiped out, leaving only a machine race of stunningly detailed monkey robots to rule the planet. What those monkey-robot bastards put in the Lincoln Memorial remains to be seen, but it won’t be pretty.